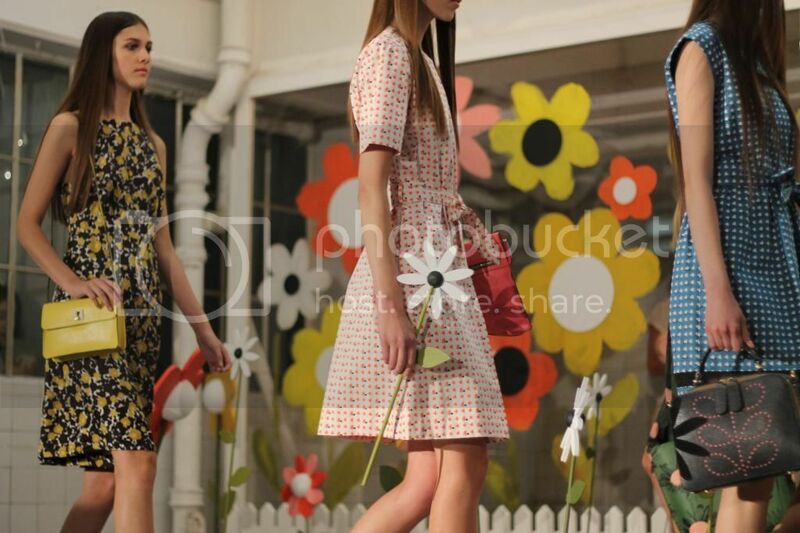 This season Orla Kiely brought us a show full of flower power in true 60's form...and as usual was a delightful presentation. As you all know this is one of my fave eras so of course Orla is always one I look forward to as she never disappoints and always draws her audience in. The back drop was a glass screen with three women stood behind it in overalls painting petals on the glass. The models entered one by one carrying oversized flowers walking between plant pots then placing the flower into one. The collection was a mix of structured coats and relaxed shorts and dresses accessorised with floral appliqué bags and shoes courtesy of Orla x Clarks AW14. Thus the plantation of new looks for SS15 was a dream! Under King's Cross station inside a narrow tunnel is where the Whistles runway show took place...so cool! This season the collection was all about textures and fabrics combining monochrome tailoring, laser-cut leathers, raffia crop tops and holographic hues with a sports wear vibe. Bum bags were worn actually on the bum and footwear came in the form of chunky espadrilles. All very much ready to wear ensembles... bring on SS15!